Kevin Punter  Jr. led UT (7-5) with 23 points, including a pair of free throws to seal the Vols final pre-conference game of the season in the final seconds. Detrick Mostella  scored 16 points, the third time in his last three games that the sophomore has scored 13 points or more. Mostella began the run by nailing a jumper with 3:08. An Armani Moore  put-back off a missed 3-pointer from Punter provided the final lead change of the afternoon that gave the Vols a 67-66 advantage with 2:26 to go. The Vols closed the game by outscoring TSU, 11-3 over the game’s final 3:26. Punter and the Vols started out hot from beyond the 3-point arc. Tennessee hit four of its first five shots from long range, including three straight from Punter. Eight of UT’s first nine field goals came from 3. The senior had 14 points at the break, but Tennessee still trailed its in-state foe by seven, 43-36, after the first 20 minutes. Mostella was the star of the second half, scoring 12 points on 5-of-8 shooting. He tied the game with a driving layup as he was fouled with 13:12 to go and gave the Vols lead, 49-48, on the ensuing free throw. After TSU rebuilt its lead, Mostella’s 3-pointer with 5:54 to play brought the Vols within a point, helping to set up the final scoring run. Wayne Martin led the Tigers (9-4) with 19 points and nine rebounds. Keron DeShields scored 13 for TSU while Marcus Roper had 10. 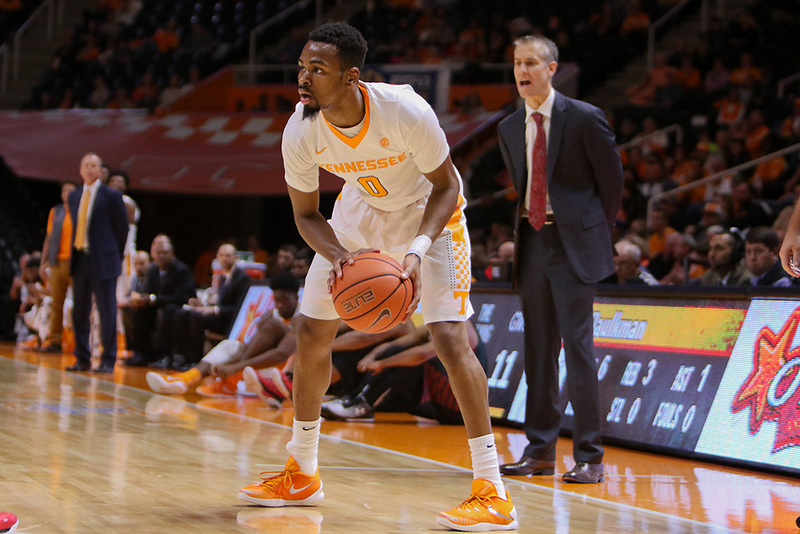 Tennessee finished the 2015 portion of the season a perfect 7-0 at Thompson-Boling Arena. The Volunteers have now won 17-consecutive home non-conference games, dating to a December 2013 loss to NC State. UT has won 19 of its last 20 games played at home in December dating to December 20th, 2011, the only loss coming against the Wolfpack in 2013. The Vols improved to 6-0 all-time against Tennessee State, all six meetings coming in Knoxville. “There is no doubt who is the better-coached team and who is the better team. I really think the best team didn’t win today. Watching Tennessee State on tape, watching what they do and the way they came in… they really did a great job of executing. We were just horrible to start the game. The way we turned the ball over, especially with some older guys being involved with it,” stated Tennessee Vols head coach Rick Barnes. “The one thing we did do is close the game. The whole game changed with Armani’s (Moore) defense in the game. He totally changed the game with the way he guarded No. 15 (Keron DeShields). More guys fed off him. We are obviously really struggling to guard. We want to double the post, but we can’t double the post when we allow people to catch the ball inside the lanem” said Barnes. Devon Baulkman  hit a 3-pointer in the opening minutes of the game, the 11th game in a row the senior has knocked down a trey. Baulkman has hit at least one in 11 of 12 games this season, only missing in the season opener vs. UNC Asheville. The streak is the longest by a Vol since Jordan McRae  made at least one 3-pointer in the first 25 games of the 2013-14 season. Overall, McRae made a 3-pointer in 37 games in a row dating to the final 12 games of the 2012-13 season. Armani Moore  reached the 100 shots-blocked plateau for his Tennessee career with three against the Tigers. Moore is the 13th Vol all-time to reach that milestone and the first since Wayne Chism  (2006-10), who finished second on the all-time list with 152. It was the seventh multi-block game of the season for Moore, who currently ranks 13th on Tennessee’s all-time blocks list with 101 career rejections. At 6-4, Moore is the shortest player in Tennessee’s top 15 for career blocks. After a fast start from long range, with eight of the first nine field goals coming on 3-pointers, Tennessee emphasized scoring in the paint in the second half. The Vols scored just six points on three made baskets in the opening half, before scoring 22 of their 38 second half points in the paint. Tennessee made 14-of-20 from inside the arc in the second half to help complete the comeback. Tennessee Volunteers are on the road Saturday, January 2nd, 2016 to face Auburn. Tip off is at 2:00pm ET (1:00pm CT).